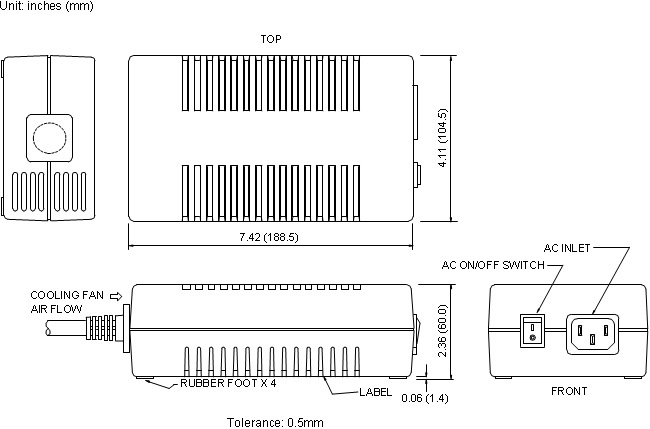 The DTA-100 series consists of grounded, single phase, switching adapters with output power up to 100W. This series has single output models with a 90~264VAC auto range input, and an IEC-320-C14 AC inlet connector. These supplies are also protected against over load, over voltage, and short circuit conditions. In addition, these supplies comply with worldwide safety requirements, electromagnetic compatibility requirements, and meets EMC requirements for desktop switching adapters. All models are 100% burn-in and Hi-pot tested. Notes: 1. Ripple and Noise is measured peak–to–peak at 20MHz bandwidth with a tantalum 10uF in parallel with a 0.1µF ceramic capacitor. 2. AC Inlet: IEC-320-C14 standard.